Ideal for iPad, Tablets, Digital Cameras, MP3 Players (iPod Touch, etc. ), TV Remotes, Calculators, Garage Door Openers, Tools, and other electronic devices! 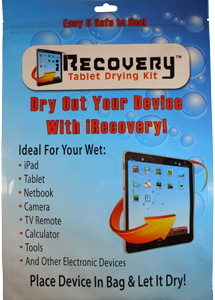 Dry Out Your Electronic Device With iRecovery Tablet Drying Kit! Kit comes ready to use! Just open top of bag, place device in bag, and zip seal the bag shut! Then just leave it in the bag for about 72 hours to dry! The bag and it's highly absorbent material will draw the moisture out of the electronic device! Full instructions listed on back of bag! Bag size is about: 9" x 13"
* We do not guarantee a successful recovery of all moisture damaged devices. Bag contains Silica Gel which is Non-Toxic. USES OF PRODUCT: Drying Electronics like iPad, TV Remote, etc.